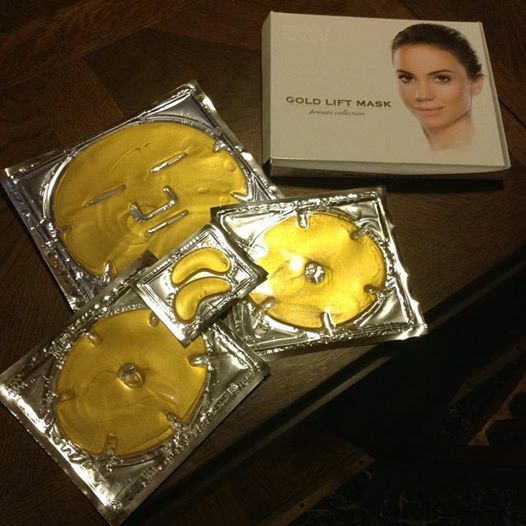 MarksvilleandMe: Gold Lift Mask " Private Collection"
Gold Lift Mask " Private Collection"
Most of my readers know I love face masks and this a totally new to me face mask made from 24 K Gold pearl/dust, and it is not a mask you have to spread on it is like a big heavy sticker you put on your face and let sit there. Totally new to me but I was up for the challenge. So far I have just used the Face Mask. The kit comes with one face mask, two breast masks and one set of eye mask. Personally I just see myself using the face and eye masks from this kit and cutting the breast masks into strips to do my face again. Easy to use no mess just leave on for 20-30 minutes, massage mask into face before removing for best results and then remove, rinse, and go about your day as usual. I like to do my face masks before going to bed at night then applying my regular face routine with an overnight cream. I love my facemasks but I really like the simplicity of a mask that I just lay on my face like this one. 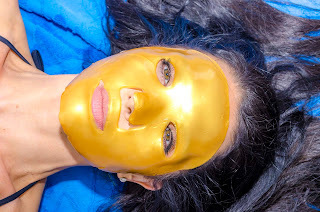 The Gold Mask Set can be found here, you can also find just the face mask on Amazon. Disclosure: MarksvilleandMe received one or more of the products mentioned above as part of a promotion with Tomoson and Body Sculpt Wraps. Regardless, MarksvilleandMe only recommends products or services we use personally and believe will be good for our readers. Some of the links in the article may be “affiliate links.” This means if you click on the link and purchase the item, I will receive compensation. If you would like MarksvilleandMe to review a product or service please contact us at marksvilleandme@gmail.com.